More Accessible Method to Measure Tumor Hypoxia? - Sound Imaging Inc.
Twenty-five percent of deaths in the United States are caused by cancer, and the number of incidences increases due to population growth, prolonged life expectancy, and an abundance of risk factors including smoking, a lack of activity, and obesity. A common feature of most tumors is a low level of oxygen, called hypoxia, the severity of which varies between tumor types. Tumour hypoxia is a condition in which tumor cells have low oxygen concentrations compared with healthy tissues, resulting from an imbalance between oxygen supply and consumption. Tumor hypoxia presence in a breast tumor leads to resistance to radiotherapy and anticancer chemotherapy as well as predisposing for increased tumor metastases. Tumour hypoxia is also a strong prognostic factor for disease progression, development of metastases, and the overall survival of a patient. A group of researchers from Austria has developed a non-invasive method for determining hypoxia and neovascularization in breast tumors using MRI data. Their novel MRI approach, which offers the potential to improve tumor characterization and facilitate tailored treatment, is designed for easy integration into a diagnostic MRI protocol. 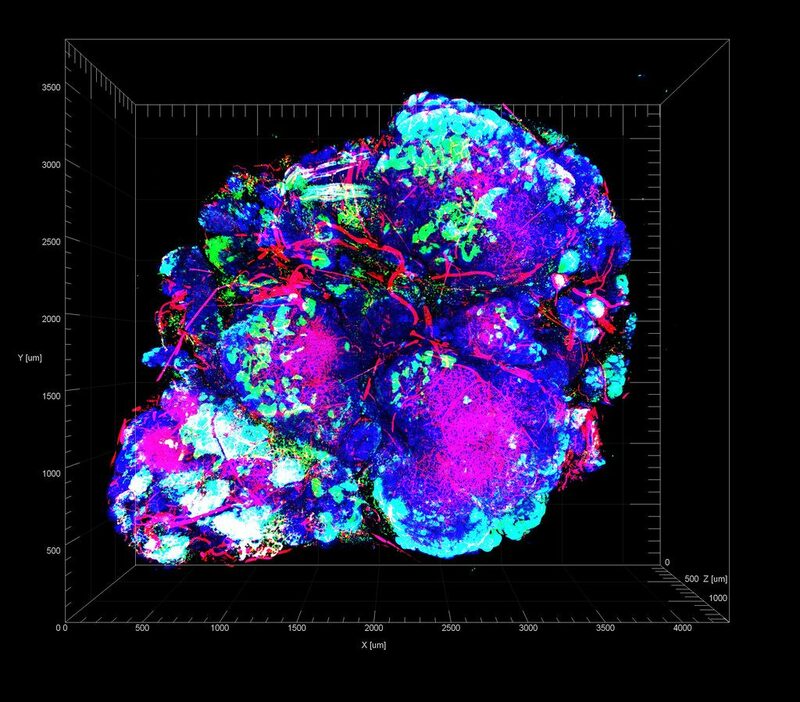 Methods to accurately assess tumor hypoxia, neovascularization and breast cancer heterogeneity, however, have been quite limited. Existing imaging approaches include PET, which has an average high cost of $5000, or near-infrared spectroscopy, which is of limited value due to its low spatial resolution. In addition, the levels of oxygenation within a tumor are highly variable from one region to another and can change over time. Two recently developed MRI techniques offer a quantitative measurement of hypoxia and have been pioneered in patients with brain cancers. Advanced quantitative blood oxygenation level dependent (qBOLD) imaging can quantify the tissue oxygen tension and provide a direct measurement of tumor hypoxia. Meanwhile, vascular architectural mapping (VAM) can measure and quantify microvascular vessel diameter and architecture. Radiologist and colleagues at the Medical University of Vienna hypothesized that this MRI-based assessment of hypoxia and neovascularization should be feasible in breast tumors. To validate their technique, the researchers performed multiparametric breast MRI, including qBOLD imaging and VAM, on 20 patients with benign and malignant breast tumors. They used the acquired data to create MRI biomarker maps of oxygen metabolism and neovascularization. All patients had a suspicious lesion with a diameter of at least 10 mm identified on mammography or breast ultrasound. Thirteen patients were diagnosed with invasive ductal carcinoma and seven had benign tumors. For the MRI sequence protocol, the team first acquired diagnostic MRI sequences, followed by T2- and T2*-mapping sequences for qBOLD imaging, coronal diffusion-weighted imaging (DWI) for VAM, and the native T1w FLASH sequence for dynamic contrast enhancement (DCE) perfusion. The authors note that only a single dose of gadolinium-based contrast media injected during the dynamic susceptibility contrast (DSC) gradient echo spin echo (GESE) perfusion sequence, was needed for this approach. The researchers used custom-made MatLab software to post-process qBOLD and VAM data and calculate quantitative MRI biomarker maps of oxygen extraction fraction, the metabolic rate of oxygen and mitochondrial oxygen tension. They used these maps to measure tissue hypoxia and neovascularization, including microvessel radius, density, and type of vascular architecture. The resulting MRI biomarker maps demonstrated intra-tumoural spatial heterogeneity with a broad range of biomarker values. The researchers determined that malignant lesions showed significantly higher microvessel density and metabolic rate of oxygen, lower mitochondrial oxygen tension and lower (more pathologic) microvessel type indicator. “This indicates that breast cancer consumes more oxygen and is more hypoxic and neovascularized than benign tumors,” the authors write. “These findings confirm the importance of tumor hypoxia and neovascularization as powerful physiological stimuli that can be exploited as a tumor-specific condition and can be used to design hypoxia-based imaging biomarkers and hypoxia-activated anti-cancer drugs.” Following the continuous improvements of MRI technology, most technologist/hospitals often overlooked important aspect such as patients’ comfort when it comes to priority. Sound Imaging is your one-stop shop for all MRI accessories that proved to increase patients’ comfort level while reducing the possibility of costly re-scan. Please, feel free to visit our website to check all our products and accessories including the MRI Visors, MRI Stereo, SAMM MD, and Bi-Directional.